perfect for your Thanksgiving feast. Wipe two 9-inch pans with oil. 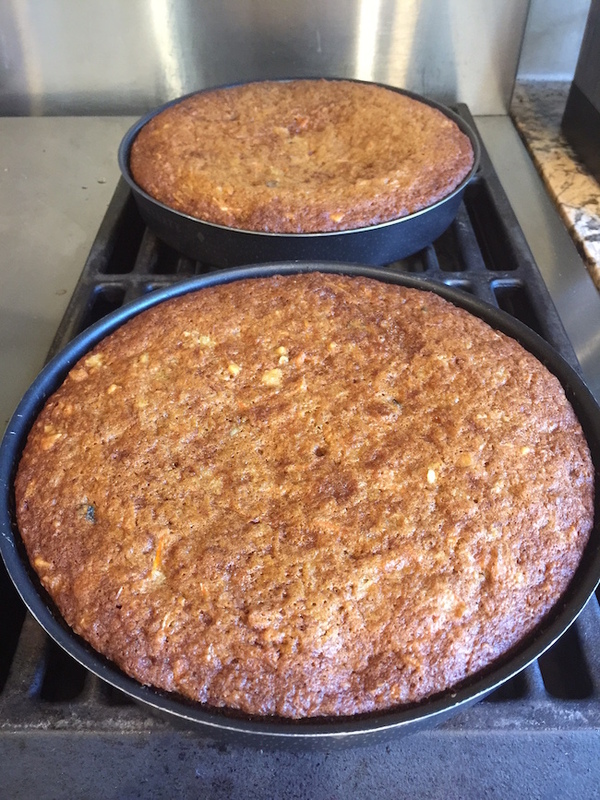 Trace, cut out and line the bottom of the pans with parchment paper. 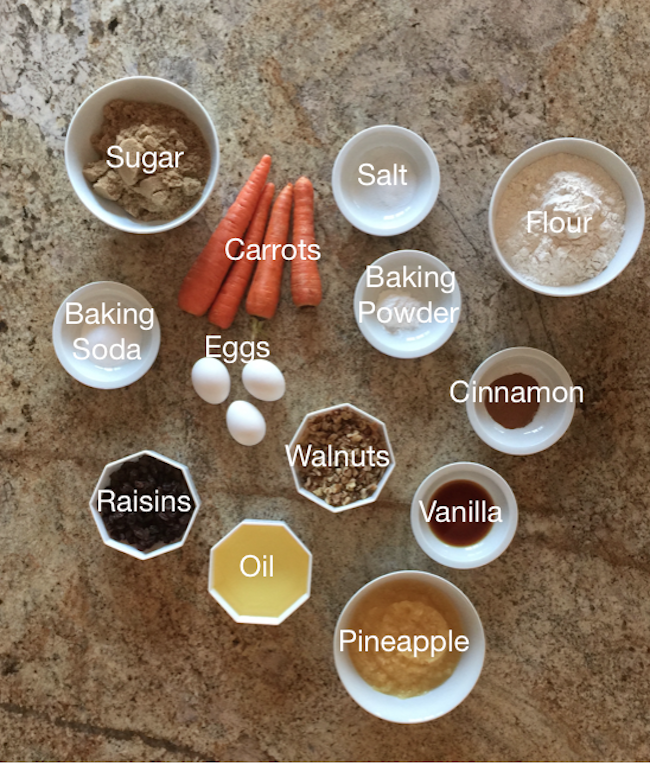 Mix eggs and sugar in mixer. Add oil and vanilla. 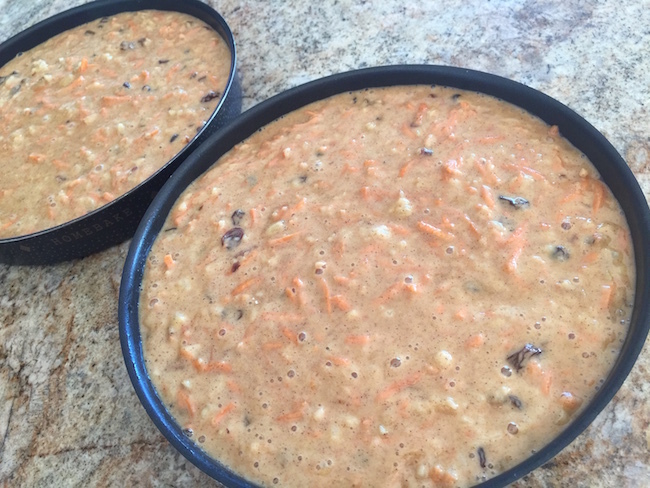 Pour mixture evenly into two prepared pans. Bake for about 30 minutes. Check if done by poking with toothpick that pulls out clean. 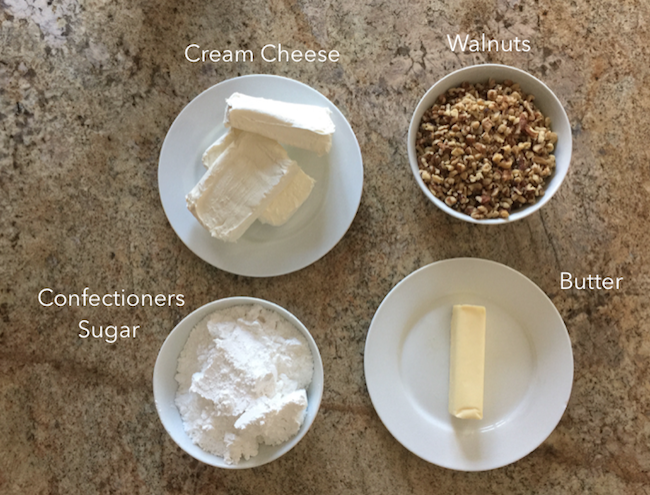 Put wax paper strips on pedestal cake decorating plate or regular plate. 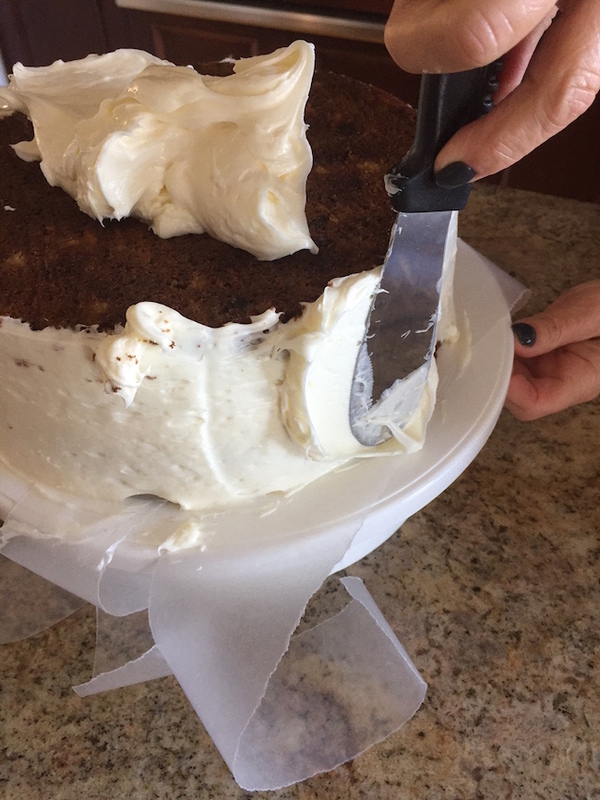 Place one cake layer on top of the wax paper strips (bottom flat side part up). 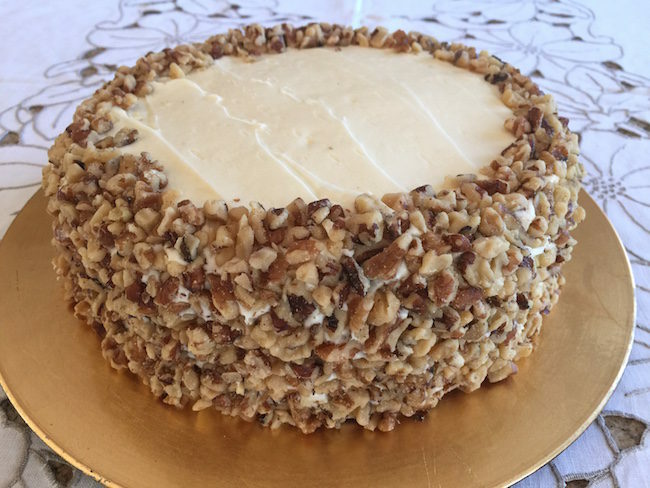 not to get too many crumbs stuck to frosting). 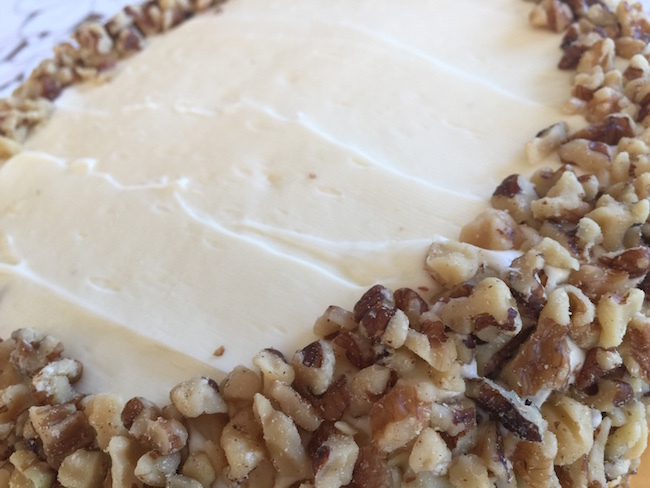 Hand-place chopped walnuts on side and edge of cake. plate while removing wax paper. 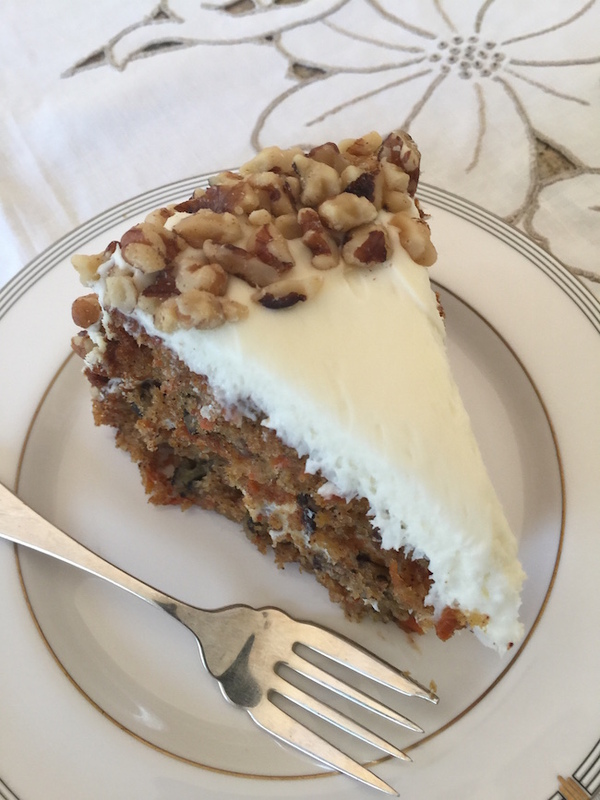 Place on cake plate. Preheat oven to 350 degrees. 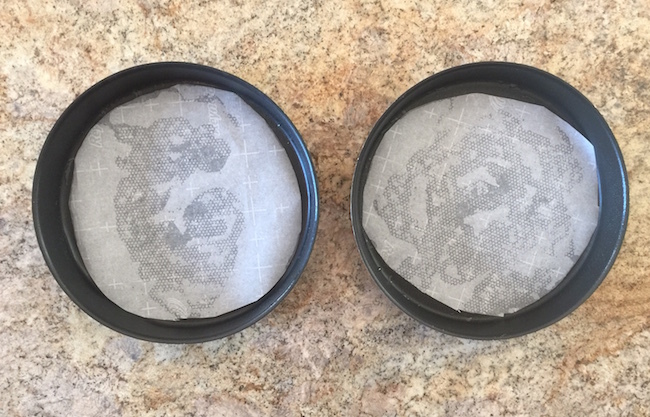 Wipe two 9-inch pans with oil. Trace, cut out and line the bottom of the pans with parchment paper. 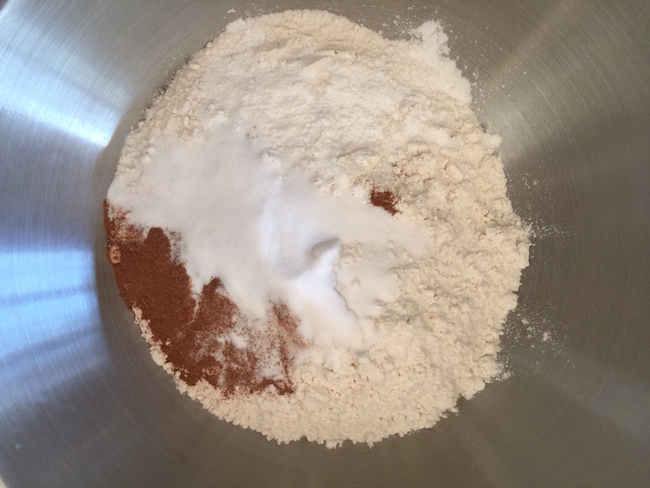 In large bowl mix dry ingredients (flour, baking soda, baking powder, salt and cinnamon) Mix eggs and sugar in mixer. Add oil and vanilla. Add carrots. 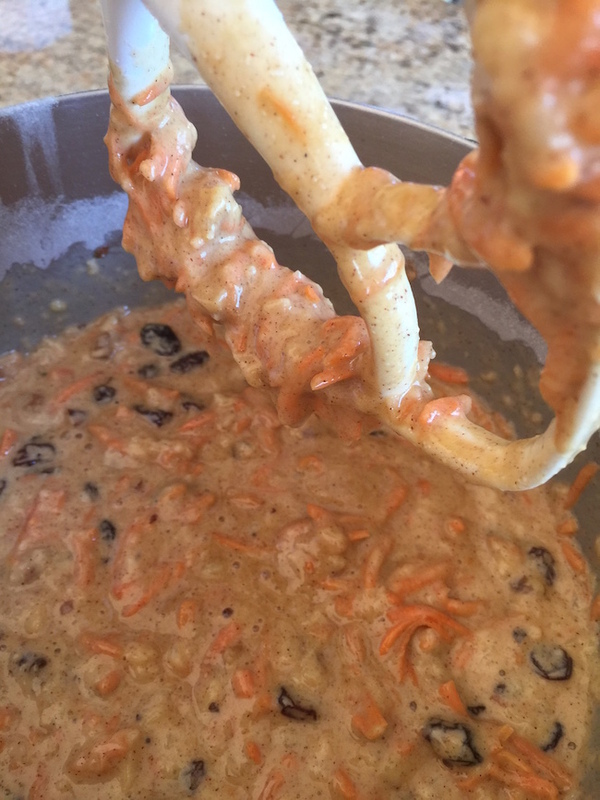 Add dry ingredients until just combined. Add pineapple. Add nuts and raisins. Bake for about 30 minutes. Check if done by poking with toothpick that pulls out clean. Cool completely then remove from pan and decorate. 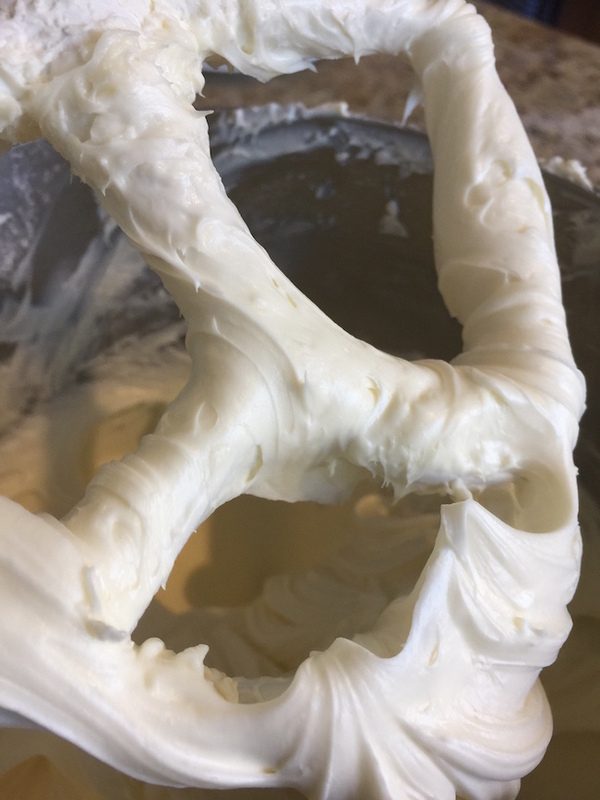 To make cream cheese frosting mix cream cheese, butter and confectioners sugar until well combined. 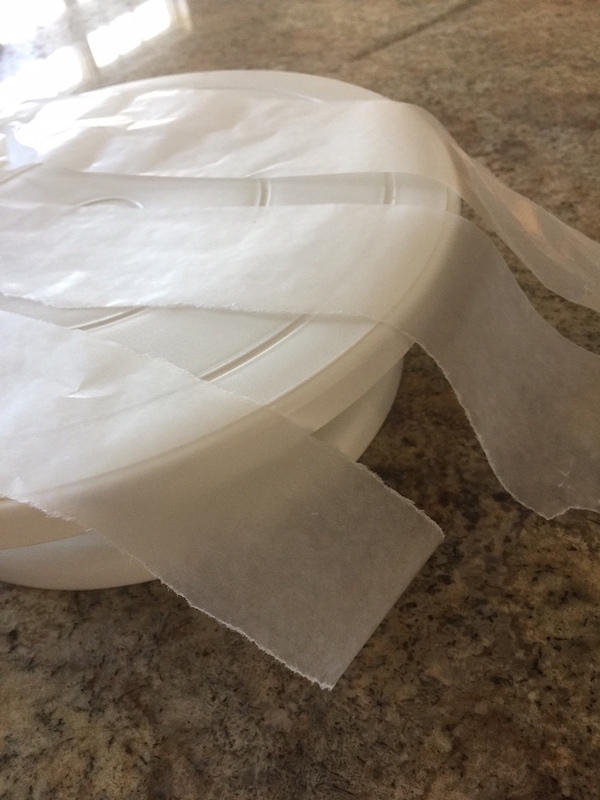 Put wax paper strips on pedestal cake decorating plate or regular plate. Place one cake layer on top of the wax paper strips (bottom flat side part up). Frost top of cake. Place second layer on top of frosted cake (flat side up). 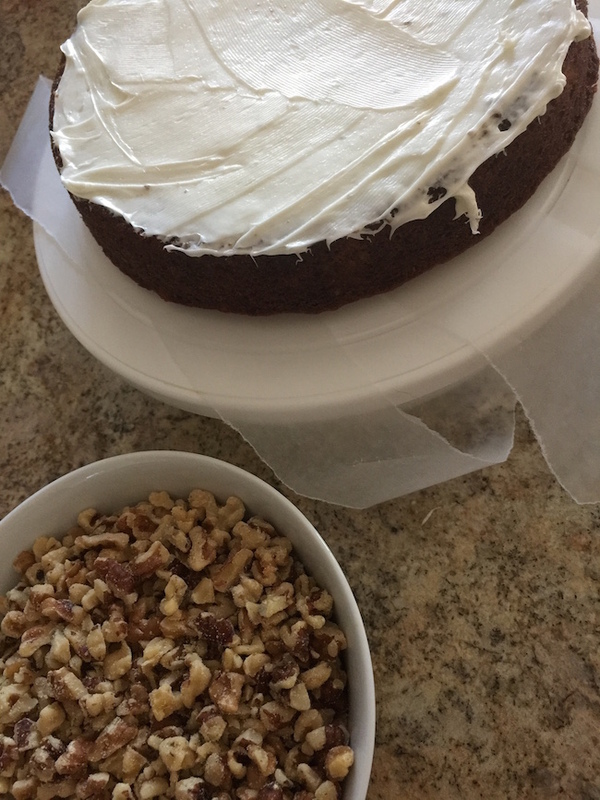 Frost sides and top of cake (trying not to get too many crumbs stuck to frosting). 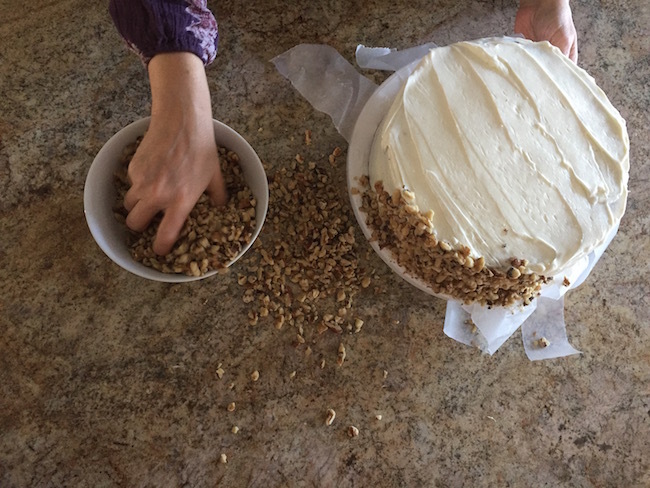 Hand-place chopped walnuts on side and edge of cake. Chill at least four hours allowing frosting to harden slightly. 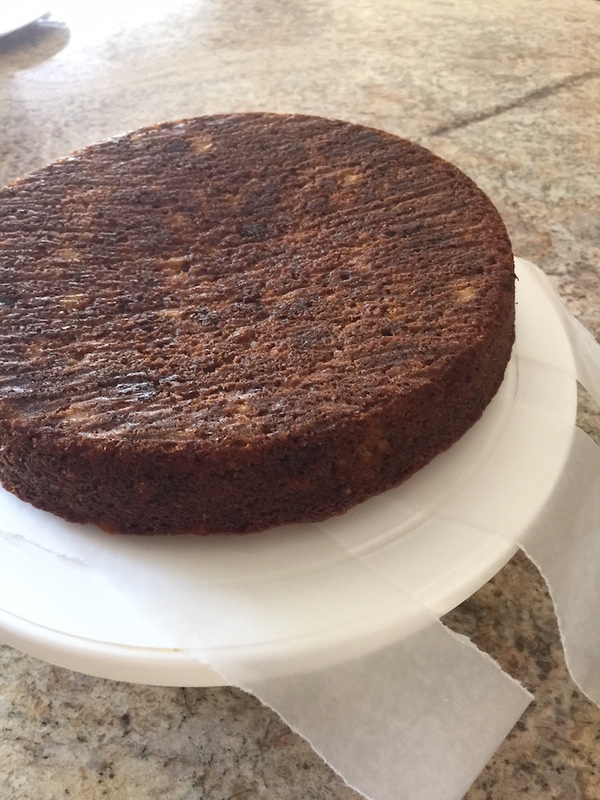 Gently slide cake from decorating plate while removing wax paper. 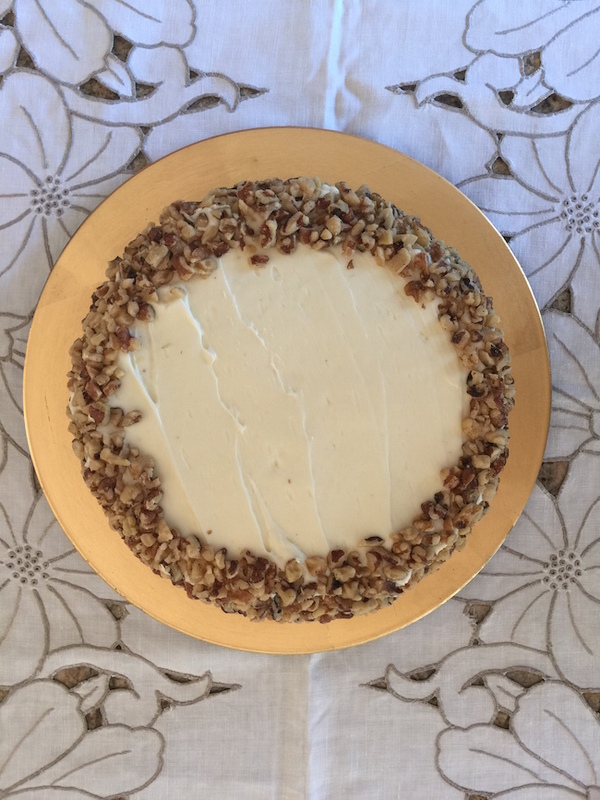 Place on cake plate. Cut and serve. It also freezes well so you can decorate at a later date.